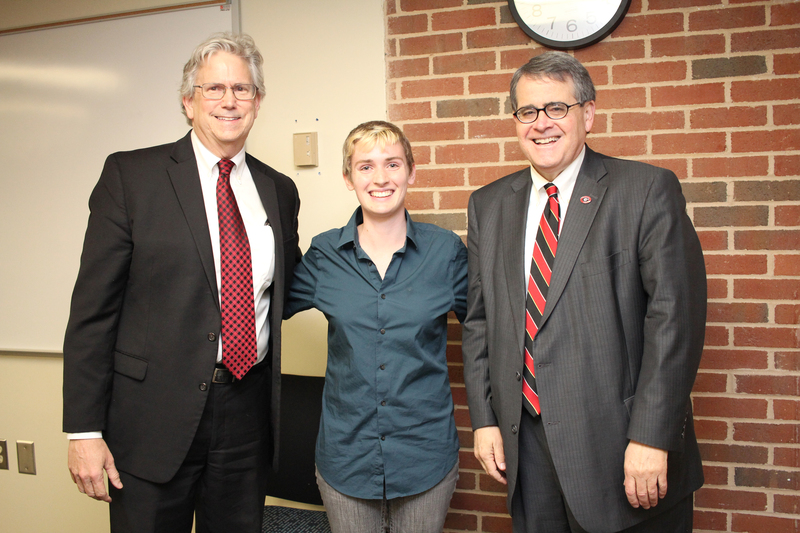 Laurel Hiatt, center, is UGA's 2018 Truman Scholar and is joined by UGA President Jere W. Morehead, right, and David S. Williams, associate provost and director of the UGA Honors Program. Truman Scholarship recipients receive $30,000 toward graduate school and have the opportunity to participate in professional development to help prepare them for careers in public service leadership. Hiatt, a third-year Honors student from Dahlonega majoring in biochemistry and molecular biology and Spanish, plans to obtain an M.D./Ph.D. in medical genetics and biochemistry and pursue a career at the forefront of clinical research, with a focus on transgender health care. Hiatt’s public service and civic activities include training a service dog through the Guide Dog Foundation for the Blind; creating new training modules as director of the Lambda Alliance Speakers’ Bureau; writing and editing content for financial advocacy nonprofit Wealthy Habits; tutoring middle school students through UGA Mathcounts Outreach; and participating in Free the Girls at UGA, which provides jobs for survivors of human trafficking. In addition to public service, Hiatt, a Foundation Fellow, is an undergraduate researcher in public health and biochemistry; has served in leadership roles for the National Alliance on Mental Illness on Campus UGA, Dungeons and Dragons at UGA and Science Olympiad Outreach; and works with the UGA LGBT Resource Center and Active Minds at UGA. This year, Hiatt also presented at the Georgia Public Health Association’s annual conference and judged at the state Georgia Science and Engineering Fair. Hiatt is currently managing editor for Ampersand Magazine and was assistant culture editor and a staff writer for the Red & Black. Hiatt’s other accolades include being named to the Dean William Tate Honor Society, presenting at the UGA Connect Conference, participating in Camp Pride and being named to Sigma Delta Pi. Fluent in Spanish, Hiatt also participated in a study abroad homestay in Costa Rica. The Harry S. Truman Scholarship Foundation was created by Congress in 1975 to be the nation’s living memorial to President Harry S. Truman. Annually, candidates for the Truman Scholarship go through a rigorous, multi-stage selection process. This year, 756 candidates were nominated by 311 colleges and universities, yielding 194 finalists. The 59 Truman Scholars were selected in early April and will receive their awards in a ceremony at the Harry S. Truman Presidential Library and Museum on May 27.